Batman V Superman and the DCEU films have been caught between two comic-book-movie worlds: the somewhat highbrow cinematic respectability and success WB has experienced withThe Dark Knight Trilogy, and the popular comic-romp success Marvel has developed with the MCU. Caught between the expectations of general audiences who were able to step blindly into Nolan's Batman trilogy (with minimal point of reference for DC lore) and dedicated DC Comics fans and movie executives at Warner Bros with significant expectations for known characters and storylines, BvS leaves gaps in its goals as a sound stand-alone narrative in service of DC universe setup. These gaps undo the movie's goals as a Superman deconstruction piece, because they leave one of its main mythos characters a cliché unexamined. I was happy to see a unique take on the character of Lex Luthor, until I realized that take was more a throwback to the Golden Age Superman mad scientist. The primary gap in the story of Batman V Superman is the motivations of Lex Luthor. In the theatrical release, Alexander Luthor Jr's plan to bring down Superman seems like a haphazard affair and his motivations are murky at best. In the Ultimate Edition, key scenes are added that make his plan not only more deviously and credibly designed to bring about Superman's downfall, but more clearly present early in the story and throughout. Out of my armchair, I have to admit that only in the Ultimate Edition, and not the theatrical release, we do have a set of events deviously designed by Luthor in a way to discredit Batman and Superman in each other's eyes. Without the additional scenes detailing the burning of the bodies at the Nairomi terrorist camp, it makes little sense that Superman is blamed for all the deaths of the occupants at the hands of Lex's mercenaries. Without seeing Superman destroy the CIA drone sent to destroy the entire camp, we don't understand we the government is unsympathetic towards Superman and unwilling to exonerate him with classified data. Without the details revealing the character of Kahina Ziri as a bribed witness falsifying testimony, the deaths in the villages she reported actually happened as a result of Superman's actions. Without the scenes detailing more of Lex's bribes ensuring criminals branded with the bat-brand are killed in prison, we're left to wonder why it would happen, or if it was in fact what Batmanactually wanted. Without the scenes detailing Lois' investigation of the Capital building bombing, we never learn that Superman couldn't see the lead-lined bomb inside the wheelchair. Without the scenes demonstrating Superman rescuing victims after the bombing, he merely runs away to Cliché Mountaintop for the movie's worst-conceived pseudo-dream sequence... functioning as an excuse to give Kevin Costner a cameo. Is this a dream we're watching? Is it a ghost? Is it Superman's conscience?" C'mere son. From up here, you can see all the useful story things that could have been done with this time. Conversations with live characters, something heroic, even. Really makes you think. The Ultimate Edition cut of the movie is over three hours long, with the full glorious detail of Lex Luthor's manipulations spelled out. 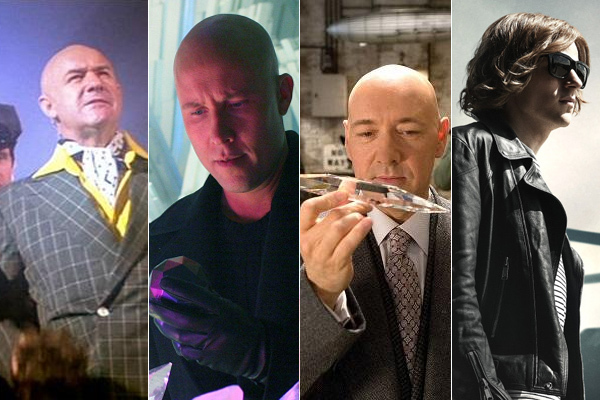 In some cases, outlets recognized it as the definitive cut of the movie, and recognize that it rescues the intelligence, if not the depth, of the character of Lex Luthor. Ben Kendrick at Screenrant.com recognizes this in a review of the blu-ray cut:"
The added footage isn’t going to alter the opinions of people who simply don’t like Eisenberg’s take on the villain but, where the theatrical cut often reduced Luthor to an unhinged weirdo, the Ultimate Edition makes it clear that he is a patient and ruthless puppeteer. Viewing the full breadth of his plan and the numerous ways he exploits the people and systems around him sets a much more intriguing precedent for the character’s role in the DCEU going forward than his appearance in Batman V Superman‘s theatrical cut might have originally suggested. This extra detail, filling in a number of gratuitous gaps but leaving others intact, only addresses the how of Luthor's plan, making it believable. The why of Alexander Luthor Jr.'s motivations, however, remain unclear. Jesse Eisenberg has taken a great deal of criticism for his portrayal of the character, but an actor can only do so much with what he is given. And Lex is given almost exclusively pathos: his character's internal conflict is defined only by a few throwaway comments about his treatment at the hands of his unseen, apparently deceased, father. His mission and plan to remove Superman seems motivated, in turn, by a generalized resentment of authority and potential power over him, expressed awkwardly in allegorical conversation with Holly Hunter's character of Senator Finch regarding his father's office and a painting of angels and devils. It ends up being very hard for me to question Mr. Eisenburg's "mad scientist" interpretation of the character when Lex's motivation for taking on this improbable cause and course seems itself without logic or sanity. After all, any sort of proclamation of concern he has made about destructive meta-humans loose in the world goes out the window as soon as he unleashes Doomsday. The end result of this is that the character defies the deconstructive technique of the rest of the movie, and actually reverts to an earlier and more clichéd form of the character of Lex Luthor, that of the irrationally Superman-hating, two-dimensional mad scientist. In the 198os DC Comics' series Man of Steel, a reboot of the Superman character helmed by John Byrne, Lex Luthor was reimagined as a captain of industry, the head of LexCorp and a ruthless businessman with a shock of red hair. Superman: The Animated Series took a similar psychological treatment of the villain and removed the hair (that the comic counterpart would eventually lose as well). 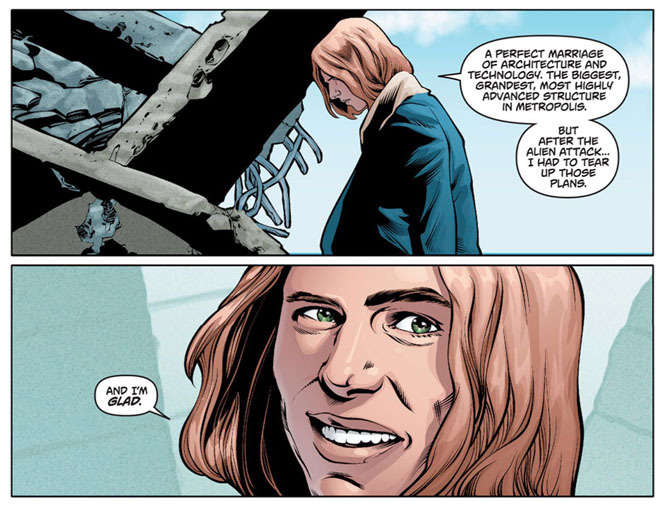 Eventually the comic reality would introduce Alexander Luthor, son of Lex, a thin young man with long red hair, very much a mad scientist of his own. Smallvillewould give us one of the most popular Lex's with Michael Rosenbaum's interpretation of a similar young Luthor, growing under the dark shadow of his father Lionel Luthor. Batman V Superman seems to give us an amalgam of the various interpretations, yet missing a vital, key ingredient: a real reason to hate Superman. You had to read a Dr. Pepper promotional comic release to learn that one of the buildings destroyed was his. Lex Luthor Sr. should have been killed offscreen in the Battle of Metropolis. How complete would that have made the ouroboros of this story? To have Luthor's motivations seem to be the same as Wayne's, even able to appeal to Wayne: a sense of justice in name (if eventually revealed to be revenge in nature), shared between the two of them? These foil characters have their fates drastically intertwined and intermingled, yet never have a face-to-face confrontation. Wayne ends up investigating Luthor, and attending one his dinner parties where they finally do trade a few minimal words, and that is really the extent of their direct interaction. 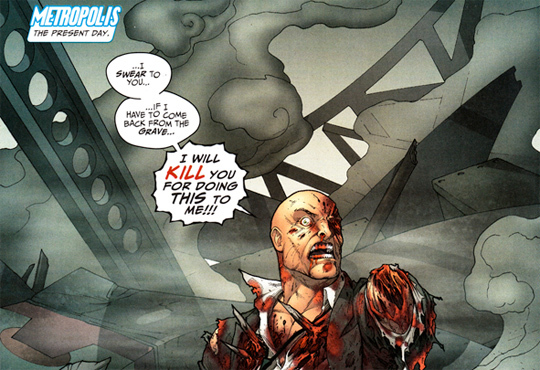 Luthor successfully manipulates Wayne into arming with his smuggled Kryptonite and attacking Superman. I feel like a great deal of time spent showing Luthor manipulatingevents to bring that about could have been substituted with direct manipulation throughdialogue, and a character relationship that would have had more meaning. If only Luthor had taken a moment to discuss Superman with Wayne privately at that party, instead of giving that awful speech. It would be a relationship arc that would certainly go places. Because, in the end, Luthor would not be able to hide the fact that his resentment of Superman taking away his father would bedifferent than Wayne's search for justice. Because Alexander wanted revenge in the first place on his father, to kill his father himself, and Superman robbed him of that... and thus becomes his new target of rage. Another plus to this simple historic revision? 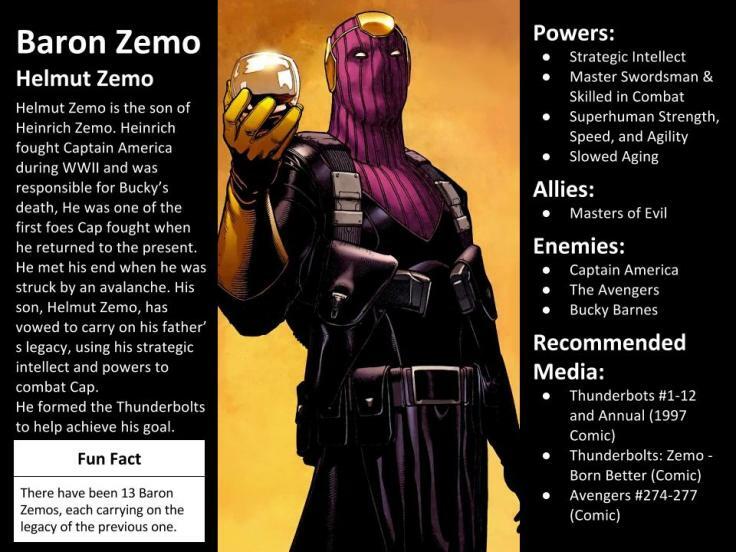 Six weeks after the release of this movie, Marvel would release Captain America: Civil War, the plot of which would extensively rewrite the background of a major villain Baron Zemo to suit its plot, making his motivation revenge for the death of his family in Sokovia after the events of Avengers: Age of Ultron. Warmly received by most fans, Civil War was forgiven for rewriting the character's origins because hismotivations were fed by the movie reality that general audiences had seen in the cinematic story so far. Like The Dark Knight trilogy, the MCU largely hews to the movie-tradition creed of owning the whole of a character's arc. That's what makes the arc satisfying, to movie audiences, seeing its beginning and end. If BvS had tied the major villain character's motivation for revenge neatly into a previous movie like this, they might have gotten credit for getting the jump on Marvel in super hero movie innovation, for once. No one lamented that this guy didn't show up, after all. Luthor holding Superman responsible for taking his father from him would have provided something more concrete for Mr. Eisenburg to latch onto in his alarmist diatribes. It would have provided him with a more concrete talking point in his father's office when trying to convince Senator Finch of the dangers of Superman. Alexander Luthor Jr.'s inexplicable God/Devil power-based hatred of Superman is the most gratuitous gap in the story of all, because now that I've considered the plug for the gap, a logical built-in fix was standing right there (in anonymous spirit) in aforementioned "Daddy's office," wondering at his own absent backstory, and death story. Furthermore the heavy concentration of DC Extended Universe scenes, setting up additional future characters and plot points for films to come, stand in awkwardly for scenes that might have filled these other gratuitous gaps. In the case of Lex Luthor's "Meta-Human Thesis," the universe-building work strikes a blow to the character's own in-story logic. When Lex is appealing to Senator Finch for an import license, he is trying to get his hands on Kryptonite. At this point in the DCEU, Kryptonians are the only super-powered beings discovered—more than one of them have arrived in a giant space weapon that attacked—and they should be the onlythreat Lex need mention to make a stronger case for weaponized Kryptonite. Why even bring up your clearly outlandish and dubious Thesis about all our myths yadda yadda, Lex? Universe-building. Face it Lex, you lost this cringey debate by discussing anything other than Kryptonians. Away from the testosterone-laden grudge match, it’s Gal Gadot’s brief appearance as Wonder Woman that really sticks out - not least because she glides through the movie with a dignified grace while everyone else’s veins are popping out of their necks. Most of the seeds for spin-offs and sequels land with a clang in Batman V Superman, but Diana Prince’s introduction doesn’t follow suit; it’s Wonder Woman, we suspect, that moviegoers will be talking about the most when they leave cinemas. Her presence is a welcome tone-changer, but nonetheless poorly motivated. When Bruce Wayne and Diana Prince meet at the same fateful aforementioned dinner party, they are both interested in Lex Luthor's files, different digital files, for different reasons. Only Bruce's reason makes sense. His goal is to discover the file with the identity of the "White Portuguese" to lead him to the smuggled Kryptonite he knows Luthor is bringing into Metropolis. Her goal is to recover a photo of her Luthor has stolen, which might reveal her identity and existence, which is not a thing you can do with a digital file ordinarily copied to a new location without deleting the original. She has specific knowledge of the photo, and the movie makes clear she can be recognized from it as well. So even if I yield the point and allow that she knowsshe cannot relieve Luthor of his copy of the file, and is instead seeking to find out what more he may know about her, is turning up in an eye-catching dress at his house for a dinner party the way to do it? Wouldn't it have been better if the reason she was present, in the movie, was because of Superman? With the "Meta-Human Thesis" data as her motivator, she becomes involved and present due to Luthor's investigation. But if Luthor's focus shifts to Superman, then it makes sense to involve her in the plot if hers does too. Isn't she also interested in this visitor from another world who, although not be the first she's seen, is the first to announce himself to this new Man's World? She might have shown some interest in the battle that leveled Metropolis the previous year, had something to say about it, something that might have made Bruce consider a different viewpoint, however briefly. It might have been a nice touch to have a scene Wonder Woman surveilling Superman, discovering who he is by quietly, surreptitiously watching... even aiding a rescue, without him knowing. She might have even traded some lines of dialogue with Superman, before the movie's climax, though I'm loathe sacrifice the best comedic moment in the film when they meet, and Superman asks Batman "Is she with you?" "I thought she was with you." It's funny because she's not with either of them. It would still flow better if she was there because of one of them. Regardless, her "recover the file" motivation is a kind of hoary old intrigue-movie cliché, something in my opinion long overdue for updating, but still widely accepted. These conventions allow a script writer to quickly lean on a movie plot shorthand to get from point A to point B, but they irritate dedicated comic fans who have been pampered by having the most outlandish plot contradictions and shorthands retconned and backfilled with detail that is always exhaustive and often outlandish. Batman's revelation regarding the "White Portuguese" code name actually being the name of a boat is another perfect example of this. It's an old movie cliché, belonging to a time before the internet. It's an awkward doorstop to keep him from going after the Kryptonite until Superman can resent him in return, and then artificially accelerate the two characters to their first confrontation.